Ho Chi Minh City, which is also known as Saigon, is the largest city in Vietnam. Formerly this city is the capital of South Vietnam. In 1975, following the defeat of South Vietnam aided by the United States from North Vietnam, the name was changed to Saigon .Ho Chi Minh City referring to Ho Chi Minh, the father of Vietnam’s independence. 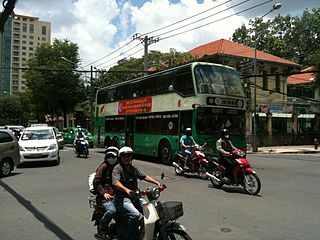 However, both the original Vietnamese and foreigners are still many who call this city by the name of Saigon. The city center is situated on the banks of the Saigon River. Metropolitan area consisting of Di An, Thu Dau Mot, Vien Hoa and surrounding towns inhabited by more than nine million people, which makes Ho Chi Minh City is considered as the largest city in Vietnam beat Hanoi was the capital of the state. Ho Chi Minh City is located in southeastern Vietnam, about 1760 km from the state capital of Hanoi. It borders the province of Binh Duong and Tay Ninh in the north, province of Ba Ria-Vung Tau and Dong Nai in the east, as well as Long An Province to the west. On the south side is the South China Sea coast with a length of about 15 km. Ho Chi Minh City has a tropical climate, with two seasons: the rainy and dry season. The climate in the city is similar to cities in tropical countries in general, tend to be hot with high humidity. Rainy season with an average rainfall up to 1800 millimeters began in May and November. The dry season lasts from December to April. The average temperature is 28 degrees Celsius and in the summer can reach 39 degrees Celsius in April. The coldest temperature usually occurs in December.